Communications Manager Wanted at ILSR! Apply by May 17th! The Institute for Local Self-Reliance (ILSR) is looking for a dynamic, enthusiastic Communications Manager to join our excellent non-profit team. This position is responsible for enacting the communications strategy for all of ILSR’s media platforms and different program initiatives. A nimble and dynamic individual able to switch between multiple tasks and program areas within a single work day, and to work independently with minimal supervision. A skilled time manager asked to maintain multiple projects and detailed communications work, which may have varying priority, length, and supervisors. Ready to sharpen existing skills and learn new ones, including: editing podcast audio, maintaining a WordPress-backed website, copy-editing blogs, commentaries, and articles destined for ILSR and other publications, writing press releases and social media materials, and cultivating relationships with reporters. Passionate about ILSR’s mission of countering corporate monopolies and building community power. A detail-oriented supervisor of a very small communications team able to delegate efficiently and catch mistakes before they go live. Unafraid of admitting mistakes, because they happen and we learn from them! Maintaining, updating, and enacting strategy for all of ILSR’s social media platforms and for its different program initiatives. Writing press releases, media advisories, and reporter outreach for a variety of ILSR original research, resources, and local technical assistance. This task includes developing and maintaining relationships with multiple reporters across subject areas. Producing and providing technical support for the Building Local Power podcast, including booking guests and writing ILSR.org blog posts to accompany episodes, and perhaps even occasional hosting duties! Helping to maintain the ILSR website, including: copy editing, selecting images and infographics, and ensuring site-wide consistency alongside senior staff. Interest is booming in cooperative and municipal Internet infrastructure and related issues. We're looking for someone passionate about working to develop policies related to Internet access, network neutrality, and publicly owned broadband. If that's you, let's talk. Are you our next creative Research Associate? Applications are due May 11th. Creative: graphics, video, audio, interactive maps, etc. Salary is commensurate with experience. Position includes employer-paid health plan, retirement match, generous vacation, a laptop for work use, and a dynamic workforce of dedicated and friendly policy wonks trying to make the world a better place. Send your materials by May 11th. It never hurts to try after that date but the ship may have sailed. We're Hiring! 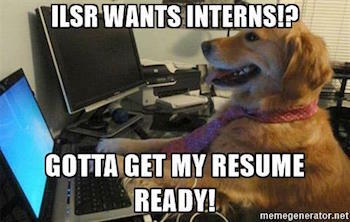 Intern at ILSR! The internship is available to undergraduate students, graduate students, and other interested individuals who can commit to 20 - 40 hours per week. Course credit may be available with approval from an academic department. We would like the position to start by May 15 but can be flexible. Please use the subject line “INTERNet Application” when sending your materials. Applications are due Friday, May 4, 2018. Feel free to apply after that date - if you are incredible, we may create another position. Never hurts to try. Please do. Creative - graphics, videos, audio, maps, etc. You do not need to know much about broadband policy or telecommunications. You do need to be passionate about public policy. Applications are due Friday, May 4, 2018. You can also view the posting on Idealist. As an increasing number of rural cooperatives make the decision to offer high-quality connectivity in their service areas, communities where local telephone and electric cooperatives already provide Fiber-to-the-Home (FTTH) are seeing benefits today. Paul Bunyan Communications, offering broadband in Minnesota’s northwest region, has lured a new employer who will bring at least 150 new jobs to the area. On March 16th, the nonprofit Delta Dental announced that it has decided to invest in a new operations and technology center in Bemidji, located about four hours and 200 miles north of the Twin Cities. The seat of Beltrami County, Bemidji’s population is around 14,300 and the community is the largest place for commerce between Duluth and Grand Forks, North Dakota. The Bemidji area is also home to three Native American Reservations and rests on the shore of Lake Bemidji. Several national and state parks and forests, along with a recreation area, attract tourists looking to escape the Twin Cities for more natural surroundings. Paul Bunyan Communications started in Bemidji as the Paul Bunyan Telephone Cooperative when a group of local citizens organized as a cooperative after purchasing a small private telephone system and another municipal telephone system in a nearby town. After expanding over the years and taking the initiative to offer Internet access, cellular service, video, and several other services, the entity has shifted to become Paul Bunyan Communications in 2010. The cooperative has been expanding the FTTH network ever since as The GigaZone. It’s received grants from the Minnesota Border-to-Border Broadband Program to help fund the expansions. As of December 2017, GigaZone connections reached more than 29,400 premises and covered more than 5,000 square miles in Beltrami County, also entering five additional counties. We're Hiring! ILSR Looking For Interns! We’re looking for an Intern to join the Community Broadband Networks Initiative team. The position is flexible with regard to hours and is based in our Minneapolis office. If you’re interested in working with us on Internet policy, check out the position posting and let us know. Interested in Internet policy issues? Want to work in an exciting field to build more resilient economies and encourage more vibrant democracy? Want to have fun doing meaningful work? The Institute for Local Self-Reliance seeks a part-time or full-time paid intern for its Community Broadband Networks program. Is creative – graphics, videos, audio, whatever. Multimedia is wonderful. Explain in 3 paragraphs why you are the ideal intern. Pay based on qualifications and time commitment.